It’s no secret that I am a HUGE coffee enthusiast. I know I flood your Instagram feed with lattes and coffee every week. I am very excited to be partnering up with Nespresso today to share a taste of Cuba with you I have had a Nespresso U machine for years. 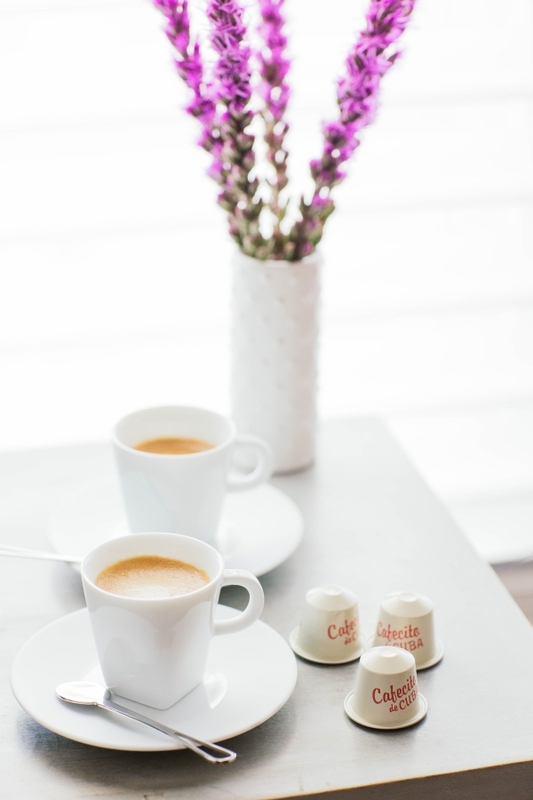 While I love heading out to grab a latte at a coffee shop, nothing beats being able to sit and relax with a great cup of coffee or espresso at home. 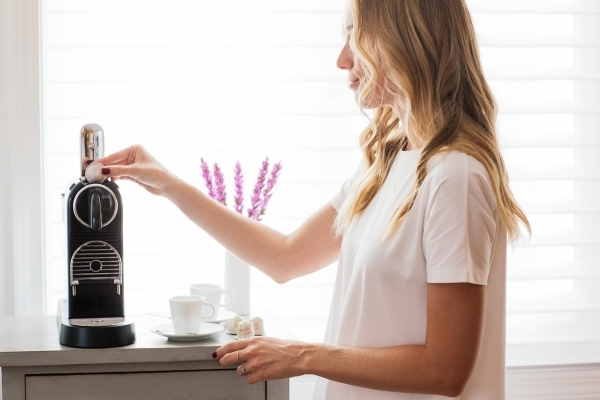 It’s very exciting that Nespresso is the first to bring the true taste of Cuba to the US in over 50 years with their new Cafecito de Cuba capsules made with 100% purely Cuban Arabica beans. I did some of my own research on Cuban culture and particularly how they enjoy their coffee. What I read is that Cuban’s LOVE their coffee. They typically enjoy a “Cafecito” which is a small coffee, served short, black and sweet. It’s enjoyed both at home and out at bars and coffee shops. What I love most is that for Cubans, coffee is a conversation starter. I 100% agree that coffee for me is an experience. It’s a time I get to sit and enjoy. I can sit and enjoy it with my hubby or enjoy with a friend over brunch. It’s those times to slow down and enjoy life moments. I really love this sense of togetherness that the Cafecito inspires. I feel like my experiences really vibe with this message. 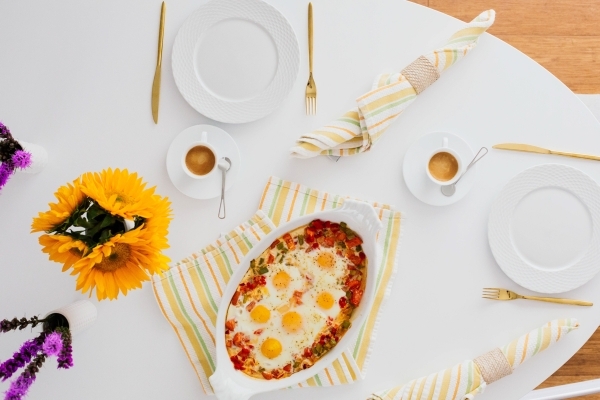 I am excited to share a brunch recipe and hosting experience inspired by the culture of Cuba. Inspired by the bold and bright colors of the streets, buildings, and cars, I wanted to keep my clean and crisp entertaining style and add a dose of color. So I did that with bright florals and some brightly covered napkins and dish towels. 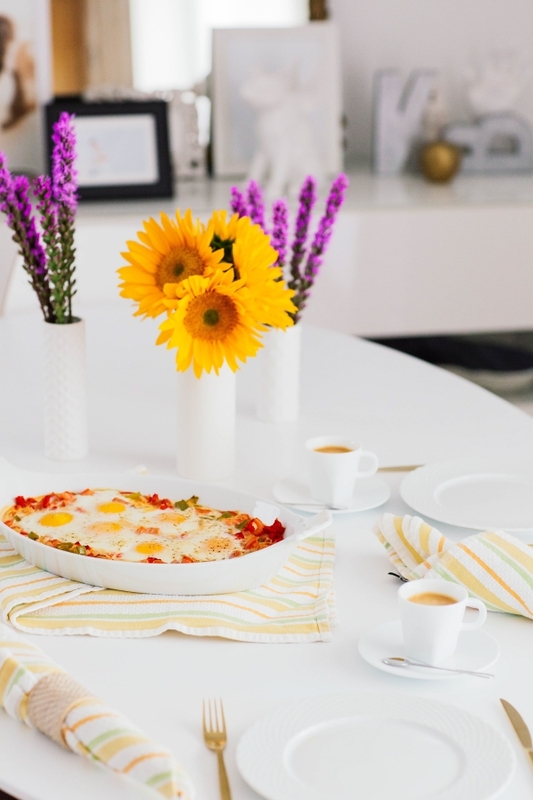 Infusing a little color is a simple way to update your brunch experience at home. 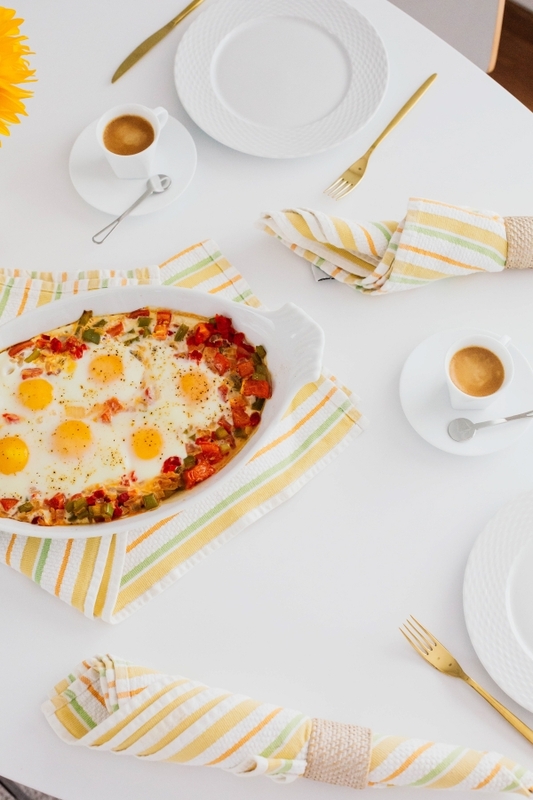 I have eggs all the time for breakfast and they are one of my favorite things to cook with. I especially love to bake eggs for brunch. It’s pretty simple to put together and I let my oven do most of the work while I can sit back and sip on coffee with friends while it cooks. Below is a new recipe I tried and love how it came out. It’s colorful and tasty and I hope you are able to try it! I think a big ritual for me is always enjoying breakfast with a cup of coffee. Especially on the weekends in Southern California, I can sit outside and sip my coffee and enjoy a leisurely breakfast. Brunch is probably my favorite over a dinner party because you get to enjoy the sunshine. 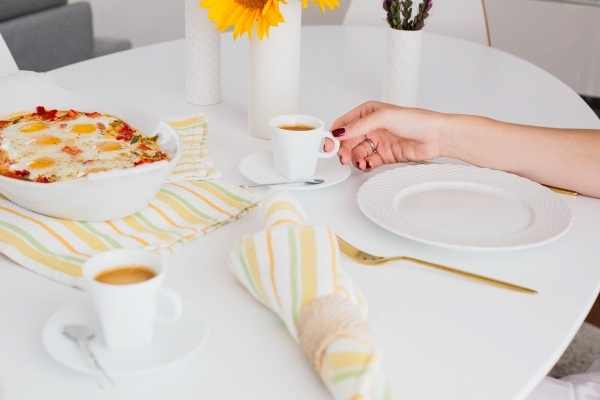 I also love the shared conversation and intimate feeling of a brunch in your own home. Coffee and eggs just seem like you can’t have one without the other so it’s the perfect match to my espresso. 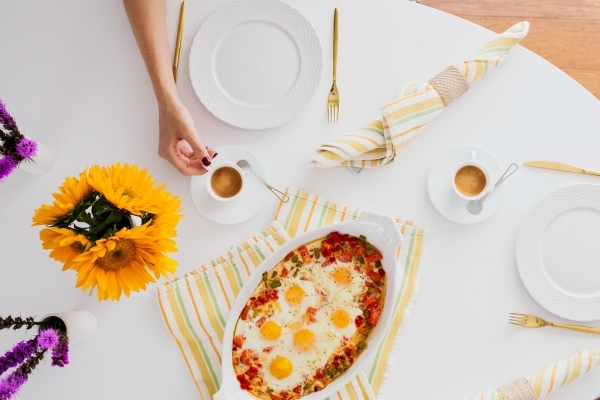 Even if you aren’t a huge cook, I feel like anyone can pull of baked eggs with ease. So I hope I can inspire you to take a leap, bake some eggs, and sip espresso with your nearest and dearest. A big thank you to Nespresso for inspiring this brunch and giving me this first taste of Cuba. Warm vegetable oil in a shallow 10-inch pan. Add the onion garlic and cook until onions are translucent for about 2 to 3 minutes. Add bell pepper and cook to soften for about 2 more minutes. Add tomatoes and cook until the mixture becomes saucy. Season with pepper and salt. Add pimientos and cook until heated for an additional 2 minutes. Transfer mixture into baking dish. 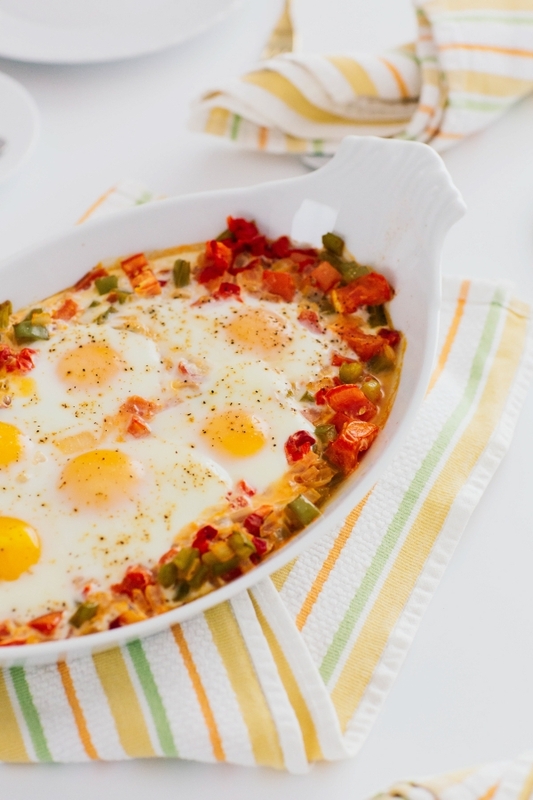 Using a spatula or large spoon, create deeps wells in the sauce for your eggs. Carefully break an egg into each of the wells being sure not to break the yolk. Pre-break your eggs into dishes if you want to make sure you don’t make any mistakes. Seasons the eggs with salt and pepper. Bake, uncovered, for about 10-15 minutes. 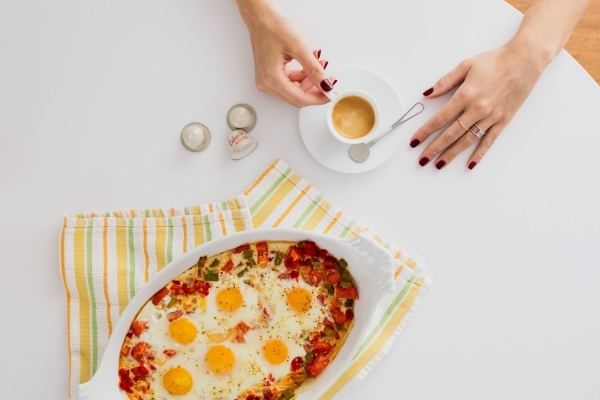 Depending on if you want a runny yolk, start checking your eggs at about 10 minutes and keep a close eye on them. When done, serve immediately and enjoy. 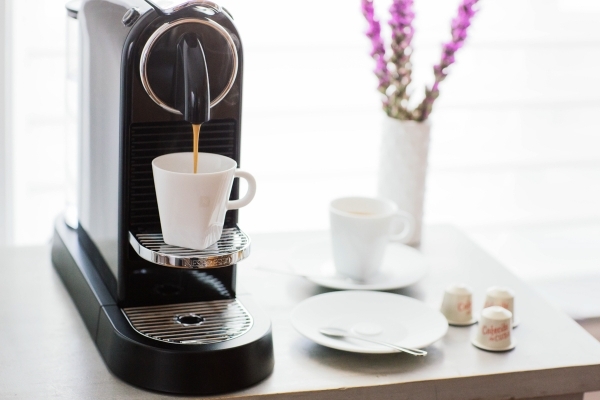 This post is a collaboration with Nespresso. brett - Love your flatware! Tammy Nguyen - This all looks beautiful! So glad I came across your page! I will definitely have to make this, it looks amazing. I will definitely be coming back to your blog often!